Editor’s Note: We previously reviewed Team Play here on Boardgame Babylon when it was only available via Schmidt Spielebecause we’re big fans of this clever game. I’m thrilled that WizKids picked it up for US distribution because this is a really fun, approachable game you can play with just about anyone. Check out our full review here. 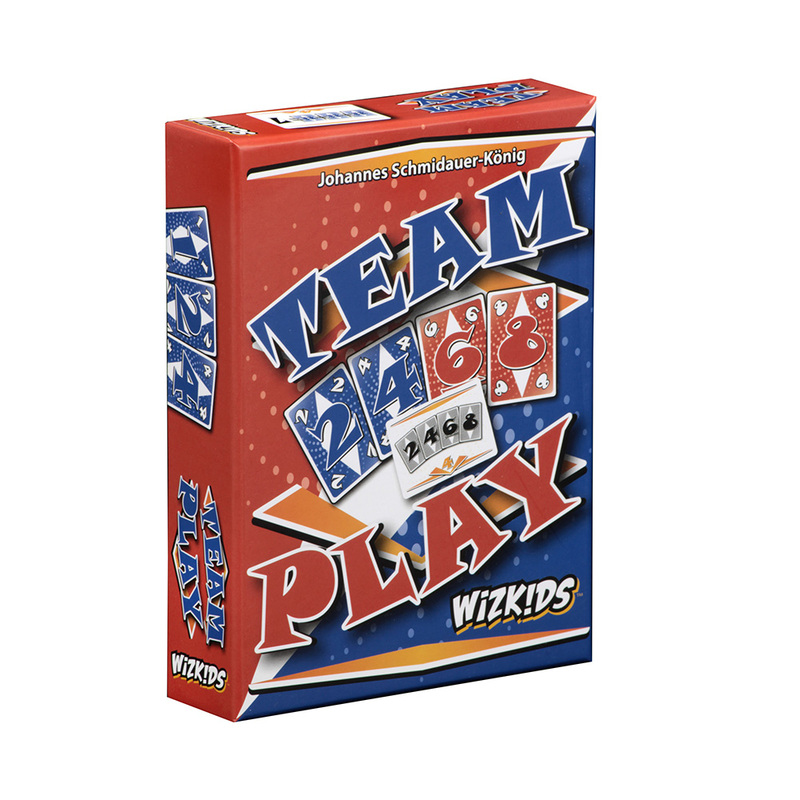 Hillside, NJ – January 31, 2018 – WizKids is excited to announce the card game, Team Play, is now available in North American game stores! Licensed from Schmidt Spiele, you and your partner work together to complete your mission cards and earn points before the other team(s). These missions are various combinations of numbers and/or colors, such as 2 pairs of uneven numbers, or having 3 low numbers, or 5 consecutive red numbers, etc. Unable to directly say what your goals are, you and your teammate must be able to read each other’s needs, helping to accomplish missions by passing crucial cards. The other team(s) are also trying to accomplish missions, so you must work smart and fast in order to score the most points. You are hard pressed to do this on your own, so team work is the key to winning! Don’t have an even number of players? That’s okay, the rule book goes over an odd player count version of the game. Players have a larger hand count, but cannot pass cards between anyone. You are a team of one in a 3 and 5 player games, but the goal remains the same. Complete missions and earn more victory points then the other players. Think you and a friend have what it takes to work together and fulfill the various missions? Or are you looking for an easy “pick up and play” party game? Be sure to pick up Team Play from your FLGS today for $19.99! Or order on Amazon. Team Play had significant buzz coming out of The Gathering of Friends 2016, seeming like it was this year’s Strike. Like Strike, which had been overlooked for a few years, GOF attendees seemed to have racked up multiple plays over the course of the event. While that’s not hard to do with shorter games, players obviously kept playing because they were having fun and I ordered a copy immediately. I was not disappointed. While this quick-play Schmidt Spiele game from Johannes Schmidauer-König has a rummy feel with the draft-and-collect mechanism at its center, the game that came to mind on our first play it Take It or Leave It. In both games, players draw variable goal cards and compile the means of fulfill them. While the latter does the job with dice, Team Play has players collect sets of cards and adds partnership to the mix. Setup provides players with a single goal card and a variable number of hand cards, with the start player receiving one and the number increasing around the table. Then, players draw two cards each turn (draft-style from a three face-up cards and the deck) to collect cards that meet the requirements of private or one public goal card. Goal cards range in value from 1 to 6 points with more points awarded for harder sets of the same rank, runs, flushes – sometimes a combo of those elements. I admire the iconography on the cards, which I find easy to explain. Completing goals gives your team points, which is how you win. The regular hand cards come in two colors (red and blue) and range in rank from 1 to 8, with three of each variation appearing in the deck. Each turn, you draw two, complete any goals you can from the cards in-hand (which are discarded). Then, you can pass one or two cards to your partner. While you are not allowed to discuss card passes, card-playing partners know how to do that with cards – both in actual passes and observation of your partner’s actions. This is one of the elements that makes Team Play work so well. I’m pretty aggressive in my passing. If I don’t need it for the goal I’m working right now, off it goes to my partner. Who knows when it will be helpful? The game ends when one team collects eight completed goal cards. While players only keep one goal card at a time, they have the option to discard the first one drawn. This is a key point since it helps players optimize their plans. I also like that you can rush the game by completing easier goals to put pressure on the other team. While this isn’t always possible, I like the strategy because it throws the over-thinkers off their guard. Those people need to move along so I always like when a game includes that option (particularly for fillers that are SUPPOSED TO BE fast). We’re big fans of Team Play around here and it’s already hit the nickel list. While it has appealed to my family with the quick play time, partnership opportunity, and the simple but planning-friendly rules, we’ve also had enormous success showing it to other people. I see this becoming one of our opening fillers for a day of games or a lovely twenty-minute closer. While the game kind of made me yearn to get my own copy of Take It or Leave It (I played the Strategicon library copy), Team Play‘s compact box means it will probably remain the choice of these two when packing up for game day.